Yeehaw! That’s a wrap on another fine week here in Saltyland. Up this weekend Vanilla and Ginger take on the Columbus Half, while Clove and her husband DB get to see all their hard work putting on the Columbus Full and Half Marathon realized! Also, Salty was conned into doing a local 5k at almost 35 weeks pregnant. We’ll see how that goes! Are you racing this weekend or is your goal race still to come this fall? Whenever it is (or was) we want to hear about it! Send us your race reports to saltyrunning [at] gmail [dot] com with the subject: Reader’s Race and we might feature you in an upcoming post! We can’t wait for Diane H.’s race report for her half this weekend. Go Diane. 2:15 or bust!!! Ok. Now it’s time to get down to business. Who’s this week’s big winner? We love this comment because this is some sage advice! No matter how good you think you feel a few days after a marathon there is likely some lingering damage that needs to heal before you should start training again. Err on the side of caution! Mile 22 of Michael’s first marathon! I’m a 53 year old husband and father (Aiden is turning 7 in a few days), and started running for fun and fitness again after a 2 decade long “couch session” last summer. At the end of April, 2011, I was so out of shape that I couldn’t walk up a flight of stairs without getting slightly out of breath, and running a mile at any speed was a major effort. I lost 30+ pounds over the course of that summer, and have managed to maintain my weight in a five pound range ever since. I completed my first marathon at the Cowtown marathon (Fort Worth, Texas) at the end of February of this year in under four hours (3:56:06), which just blew me away. I honestly didn’t think I had that in me and I’m still not sure how I did it. I have a blog that I update periodically (need to get better about that) at http://www.marathonafterfifty.blogspot.com/ , and always enjoy the comments. I really enjoy your blog, and though I don’t comment often, I read all the postings and enjoy the variety of perspectives. Thanks for the selection, and I hope you have a wonderful day! THANK YOU, Michael and we hope you and the rest of the Salty Readers have a wonderful day too! I always love the COTW post because we get to learn more about our awesome readers! 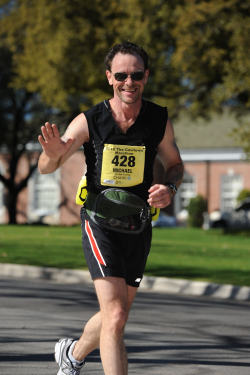 Thanks again, Michael, for your insight on marathon recovery and for sharing your inspiring story with us. Me too! So many of our readers have such interesting stories!